Brooklyn & Boyle | Art and Life in Boyle Heights : Vincent Price Art Museum Offers ¡Tapas & Art! Vincent Price Art Museum Offers ¡Tapas & Art! When the late Vincent Price and his wife Mary Grant Price donated 90 pieces of art to East LA College in 1957, they probably did not imagine that the gift would someday become the cornerstone of a world-class museum collection and a vital institution. Price, the legendary actor best known for an affinity toward horror, thrillers and the macabre during a long and illustrious career as a Hollywood actor, was also a respected art collector who earned his art history degree at Yale University. The modest collection of Mesoamerican, African, Native American, and European artworks was provided to establish a teaching resource for the ethnically diverse and largely working-class students at ELAC who won the renowned patrons over with their genuine love for art and their enthusiastic commitment to its study. Over the next 40 years, the Prices would add to their original donation until the collection housed at ELAC’s then named Vincent & Mary Price Gallery would number roughly 2,000 objects. Just under six decades later and only 23 years after his death, the Vincent Price Art Museum comprises a permanent collection of over 9,000 objects conservatively valued at over $5 million. More importantly, the Los Angeles Community College District, in a fit of visionary acumen, supported the construction of a modern fine arts complex on the ELAC campus. The complex includes a state-of-the-art museum facility appropriately named for its original benefactor. Since its grand re-opening in 2011 the VPAM has organized and presented a non-stop barrage of exhibitions drawn from its substantial collection, juried selection and on-site installations created specifically for the museum space by featured artists. With input from the newly expanded VPAM Foundation Board, chaired by Pete Galindo, the museum has blazed a trail on LA’s East Side with related programming, symposiums, and panel discussions. This Saturday, the VPAM Foundation Board will host its very first scholarship fundraiser scheduled to coincide with the closing of two concurrent exhibitions: Crossroads in Clay at Chuinard & Otis in the main gallery and the Juried Student Art Exhibition in the smaller, downstairs gallery. “We’re calling it ‘Tapas & Art’ because it features an eclectic fusion of food, an art auction and music,” says board member Consuelo Velasco Montoya. A program coordinator and lecturer at Otis College of Art & Design, she was recently appointed as part of a board expansion meant to bolster the visibility and accessibility of the VPAM within and without the East Side community. “I am really proud to be a part of the Vincent Price Art Museum, located in the community where my family and I are planting roots. Getting involved locally and the potential of bringing communities together is what excites me most about being on the board. I embrace the opportunity to introduce or welcome folks back to this great cultural resource on the East Side of Los Angeles,” Velasco Montoya continues. Galindo, who was an early advocate for the board expansion, is justifiably proud of the progress that has been achieved since his assumption of the chairmanship. A former program manager at the Venice-based Social & Public Art Resource Center (SPARC), Galindo also co-founded the Federal Art Project in Downtown LA and is a current principal at Civic Center Studios, a multi-media production company. Raised in the Ramona Gardens housing projects less than two miles from the site of the VPAM, he has strong faith in the newly appointed board members and their ability to marshal the kind of energy and resources necessary to position the museum among spaces such as the Los Angeles County Museum of Art (LACMA), the Fowler Museum at UCLA, the Skirball Cultural Center, The Hammer Museum and The Getty Center. He is a vocal proponent of the widely held belief that the VPAM, with its collection alone, is as viable and germane with respect to the discussions based on defining LA’s cultural identity and who really gets to determine what constitutes the creative soul of the city as are any of the aforementioned cultural institutions. “As Chair of the Board of Directors, I’m focused on developing a board that is representative of the surrounding community and responsive to its needs. The Vincent Price Art Museum is becoming increasingly important as a venue for local artists as well as those practicing throughout Southern California. It’s our responsibility to ensure that our program continues to be dynamic, relevant, and, above all, accessible,” explains Galindo. 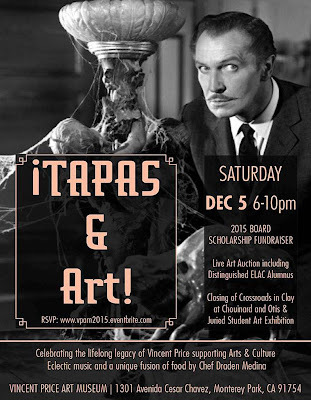 The ¡Tapas & Art! Scholarship Fundraiser will be held from 6 p.m. to 10 p.m. on Saturday, December 5th. The evening gala features a live art auction that includes work by notable ELAC alumni and an array of unique fusion menu creations by Chef Draden Medina as well as live music. Reservations can be made at www.vpam2015.eventbrite.com. A special community discount code is available from Brooklyn & Boyle. Send a text to 213.858.8252 or email brooklynandboyle@gmail.com for details.